For those who have a PS4 or Xbox One game consoler on hand, you can not only play fantastic 3D games, but also enjoy vivid 3D movies on 3D TV through PS4/Xbox One smoothly. Here, we will guide you rip and convert 3D Blu-ray movies to PS4 and Xbox One supported 3D SBS videos for setting up your home media. To convert 3D Blu-ray for PS4/Xbox One, you can use the user-friendly software like Brorsoft Video Converter Ultimate (Windows /Mac) to do the job. With the program, you can rip any (protected) 3D Blu-ray to PS4/Xbox One supported 3D side-by-side MP4, AVI, MOV, MKV, WMV, etc formats quickly and losslessly. Besides, you can also convert DVD disc and common 2D/HD/4K videos in HEVC, MXF, AVI, M2TS, XVAC S, MOV formats to more popular video formats for widely using in iPad, iPhone, Android , Apple TV, Samsung, Xbox, PS3/PS4 and more. With the built-in editor, you can trim the video length, crop the black bar, add personal watermark, adjust video effect and more in one place. NOTE: Anywhere from 30 to 60 GB of hard disk space is needed depending on what you’re ripping. Blu-Rays are big, and we’re going to rip the whole thing to our drive first, so depending on the movie you’re ripping and the quality you want in your final movie file, you’ll need a good amount of space. Here, Windows version Blu-ray video converter taken as example, Mac share the same way except tiny differences on interface. Step 1. Install and launch the best 3D video converter, simply click “Load File” to load your 3D Blu-ray movies to the program. Here, Blu-ray, DVD disc, other common videos are supported as well. Step 2. Click “Format” to select an output profile. 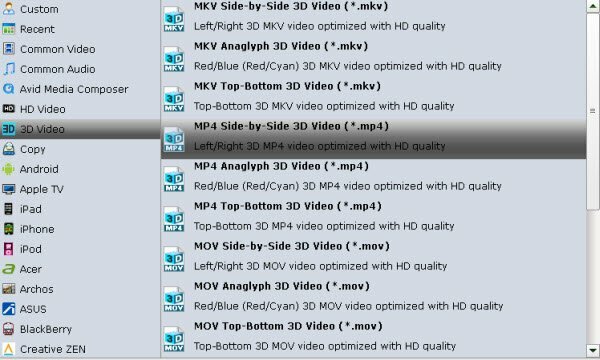 Here you can follow the path “MP4 Side-by-Side 3D Video (*.mp4)” for ripping 3D Blu-ray to side-by-side 3D MP4 video for PS4 and Xbox One. If you like, you can click the “Settings” button to do corresponding settings regarding to video, audio. Plus, you can also select 3D Anaglyph like Left/Right mode. Step 3. Finally, you just need to go back to the main interface, hit the “Convert” button to rip and convert 3D Blu-ray to 3D video conversion for Xbox One and PS4. 3D Blu-ray copy protection will be removed automatically. When the conversion is complete, you can get the ripped 3D videos via clicking open button, then save them to the USB, insert the USB to Xbox One or PS4 for watching smoothly. This entry was posted in 3D Blu-ray and tagged convert 3d blu-ray to ps4, convert 3d blu-ray to xbox one, watch 3d blu-ray on ps4, watch 3d blu-ray on xbox one. Bookmark the permalink. Whoa! This really is one of the most helpful things on the topic I have ever come across. Thanks for your hard work. All in one solution to backup Blu-ray for PS4 and Xbox. Thanks for sharing here.